I spent the day making customized key chains. Each key chain is a different patchwork or crazy quilt pattern. 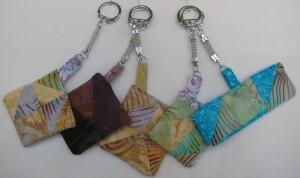 It was a fun, creative project and I enjoyed coordinating colors while using up scraps. It is not too hard to make or very time consuming. The nicest touch is that they can be personalized, so they make cute gifts. I figured out how to use the embroidery feature on my sewing machine and I can add names, initials and short messages to each key chain. Here are some samples.